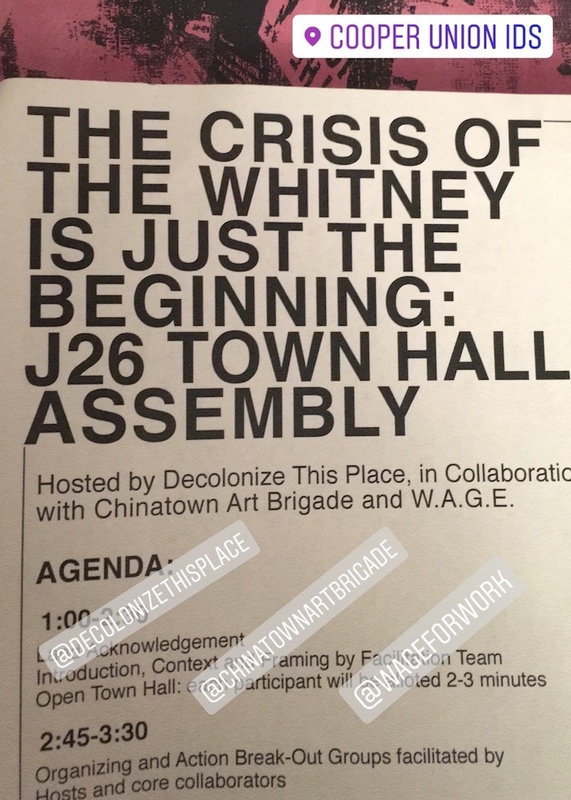 Yesterday, Marabou attended the Town Hall Assembly at the Cooper Union hosted by Decolonize This Place, Chinatown Art Brigade, and W.A.G.E. Over 200 people were in attendance. Below are some images and words from a day filled with expression of thoughts on the situation at The Whitney regarding Vice Chairman Warren Kanders and discussion of how people can come together as a collective voice and create the necessary changes to power dynamics and representation in museums. Agendas were distributed to all explaining the schedule for the day. A representative from the Chinatown Art Brigade co-opened the assembly. Quote from one of the participants. A quote included in the Town Hall agenda that summarizes one of the purposes behind the assembly. A participant reminds everyone of the power of the collective voice. A question posed during the open discussion.